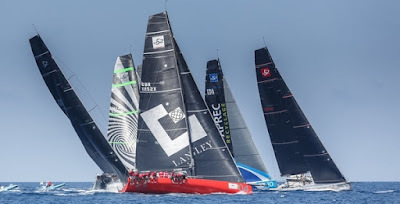 From two sparking races, one windward-leeward, one coastal, the screws turned ever tighter as the three cornered battle at the top of the fleet at the 52 Super Series’ Settimana delle Bocche on the Costa Smeralda sees only one point separating the top three teams. 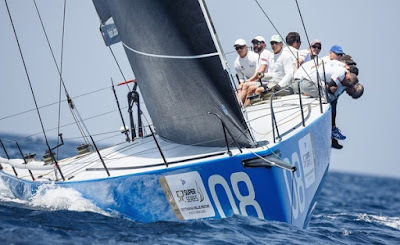 Class newcomers Bronenosec, Vladimir Liubomirov’s Russian flagged team which has a strong Italian flavour, continue to more than hold their own among the more regular top of the table duellists, Quantum Racing and Azzurra. 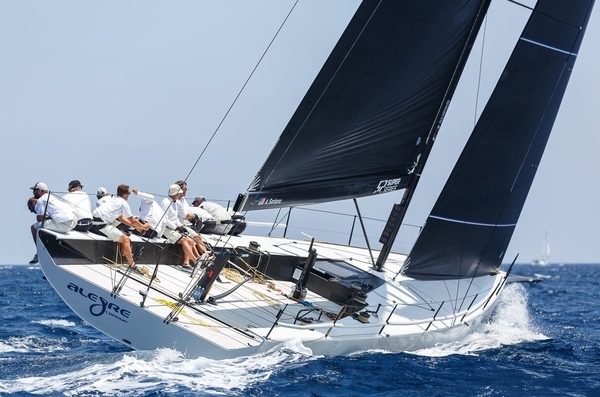 On the strength of their three race wins Bronenosec are credited with the regatta lead on countback ahead of the quietly consistent Quantum Racing. Both are on 16 points while Azzurra, today’s best scoring team with a 1,2 hold third overall on 17pts after five races have been sailed. The home club’s Azzurra needed to bounce back strongly after a disappointing Wednesday coastal race. The wheels pretty much fell off their challenge momentarily on that 31 miler, repairing to a seventh place. But the crew which is lead by Guillermo Parada proved their debrief had worked and came out and won the first race – a windward-leeward – when they had the club’s commodore Mr Bonadeo on board as their talismanic guest. 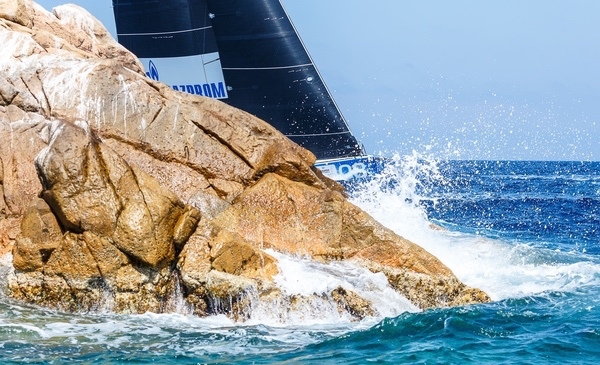 Azzurra started well off the pin end of the line and chased Bronenosec around the top mark, tacking just in front of Quantum Racing. At the leeward gate there was little to choose between the three. But Vasco Vascotto picked the right hand mark looking upwind and stole the overall lead by the top turn, second time up. Down the run Bronenosec also lost Sled to finish fourth, leaving Liubomirov’s crew mildly disappointed to have dropped from first to fourth. 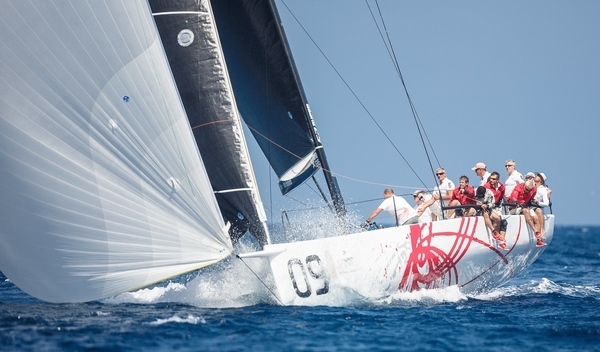 “We lead to the top mark and then we just struggled on the second upwind. 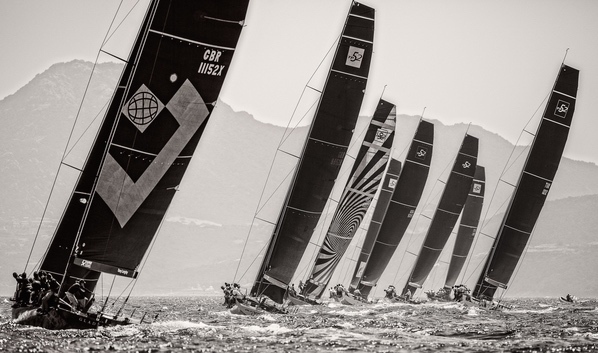 We were not going that well speed-wise and tactically we did not do it that well. So we were a bit disappointed but then we also had to remind ourselves that fourth in this fleet is a very good result in this fleet,” Bronesonec strategist Cameron Dunn (NZL) said. 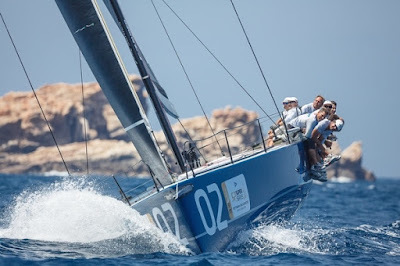 Bronenosec and Azzurra, hull sisters from the same mould at King Marine, made the early jump in the short, sharp 18 miles uphill-reach -downhill coastal race around a couple of islands south of Costa Smeralda, Mortoriotto, Mortotrio and Soffi. Sail selection ideas on the reach across from Mortorio to round Soffi varied from the seldom flown A3s to bigger reaching kites. 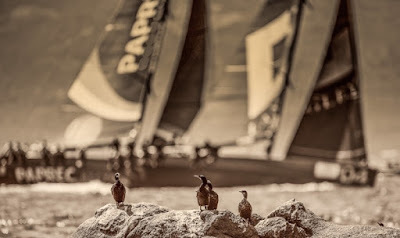 But the key move for Bronenosec came when the breeze went ahead after Soffi and they were smarter in their kite drop, taking height and speed to ride over Azzurra who had to sail low to drop their kite. That was opportunity enough for the Russian team and they went on to win. 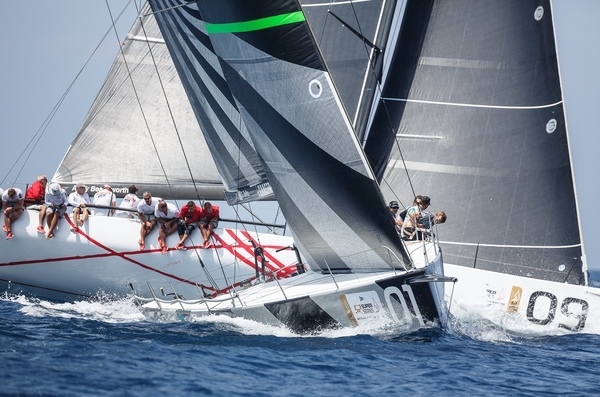 Opportunities were seized as they came for Quantum Racing who climbed through the fleet from sixth to third. 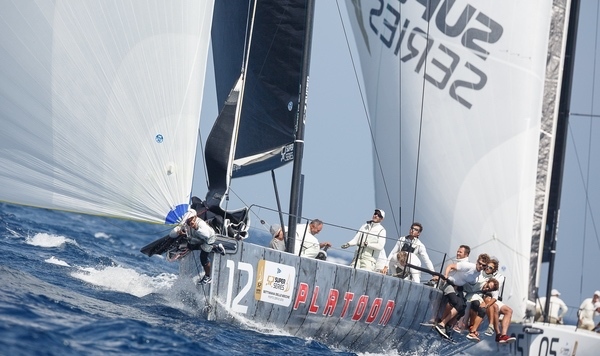 First they passed Gladiator, then Platoon when the German team made the wrong kite selection on the broadening reach and had to peel, and finally pipped Sled in the final two minutes downwind into the finish. 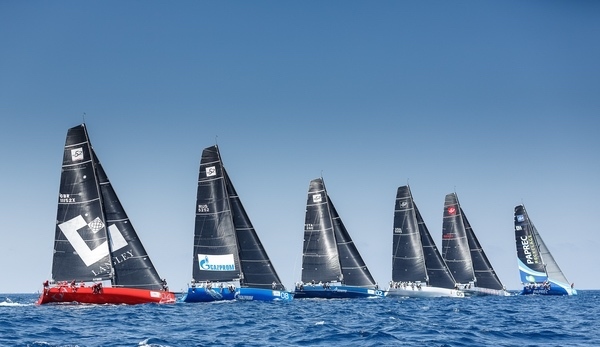 Patience and persistence were keys for Quantum Racing as much as they were for Bronenosec. 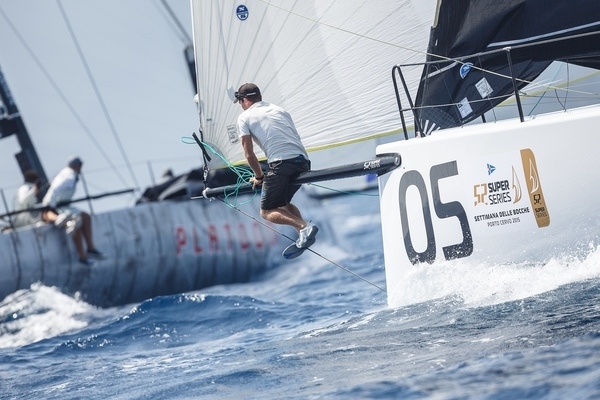 Strategist Dunn paid tribute to the talents of Bronenosec owner-driver Liubomirov who only steered a TP52 for the first time one week before late May’s Valencia regatta. “The core of the team have come from the RC44 and so the core of this team have been together for a year and a half. But it is a really good, relaxed bunch of guys who are very dedicated to do well. Everyone is really open. The debriefs are really open. 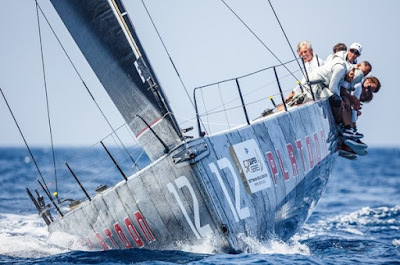 We have Francesco de Angelis in the coach boat who does a fantastic job in the debriefs, telling us what the other boats are doing. We are trying to do that. 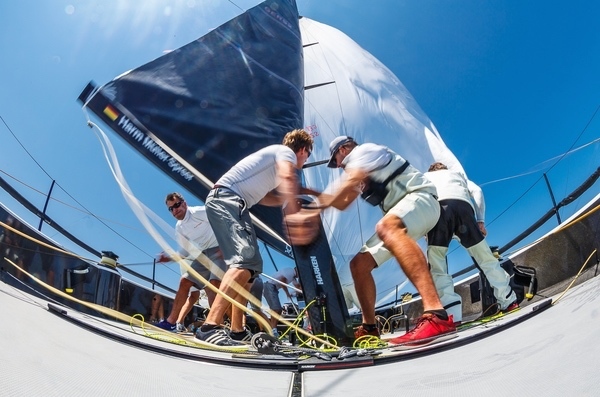 We have good speed, we keep it solid and I think have been sailing well but it is pretty tough,” Dunn added. Azzurra’s 1,2 today got them right back into the title fight while Quantum Racing’s 2,3 keeps them inside the target averages, while Bronenosec show all the credentials of possible regatta winners. 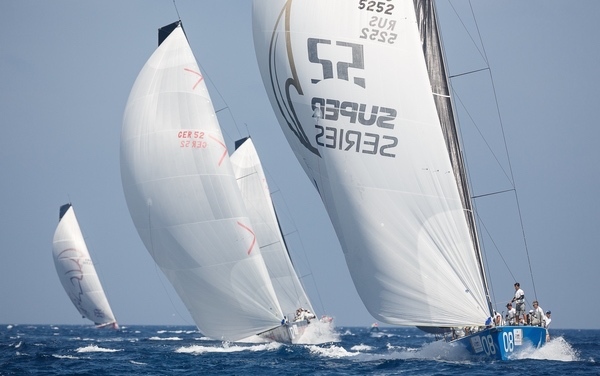 The top group have a gap of six or seven points to fourth placed Sled who went 3,4 today. Breezes are expected to be significantly stronger Friday and Saturday, setting the scene for a big finish to what is already one of the most exciting and closest fought regattas of recent years.